Here’s a new program offered to all Talk N text prepaid subscribers, you can now get free text and internet data promo daily good for 30 days. 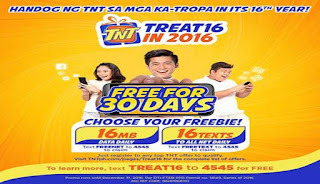 This is available to all TNT users nationwide who register to their top call and text promos. No need to reload your account to join this program after you register to their qualified promo. This is a treat to their loyal subscribers as Talk N Text is now on the 16th year in communication service. To get free internet every day, you need to text the keyword FREENET and for free SMS daily just text FREETEXT using your TNT SIM card. After you successfully claim the freebie you can quickly go online by turning on your phone’s mobile data and immediately text your love ones. As mentioned above, you need to enroll to any top TNT offer to qualify for this offer. You can claim your freebie as long as the base top promo you subscribed is still active. Free data and text will reset daily at 12 midnight and subscribers may only avail the freebie once during its validity. Chosen freebie will be credited daily, for 30 days and valid until December 31, 2016. 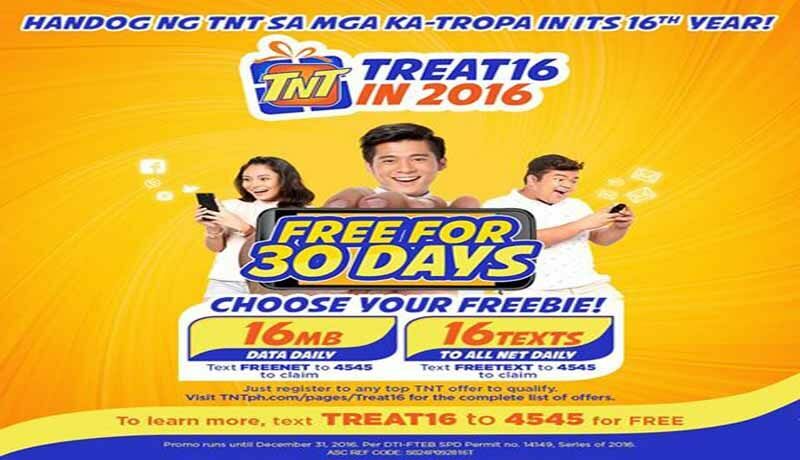 To know more about this offer, you can also text TREAT16 to 4545 for free. can i get both promo? i reg on utp10 last week and get the freenet and today i will reg again on UTP10, can i get the freetext this time.do i still receive 16mb of data everyday? how to stop free net?